Khomdram Gambhir Singh with his sister in Khumbong village on the outskirts of Imphal, in India's northeastern Manipur state. An Indian man missing for 40 years has had an emotional reunion with his family after a YouTube video of him singing a popular Bollywood song went viral. Khomdram Gambhir Singh embraced and hugged his family in Imphal, in the remote northeastern state of Manipur, which he left in 1978 after separating from his wife. Family members burst into tears and garlanded Singh, 66, as he arrived in his hometown Thursday. "I tried a lot to come back home but I didn't have many options," Singh told AFP. For four decades after he left, his family heard nothing. Then a clip showing a grey-bearded man singing a Bollywood song on a Mumbai street 3,300 kilometres away appeared online. 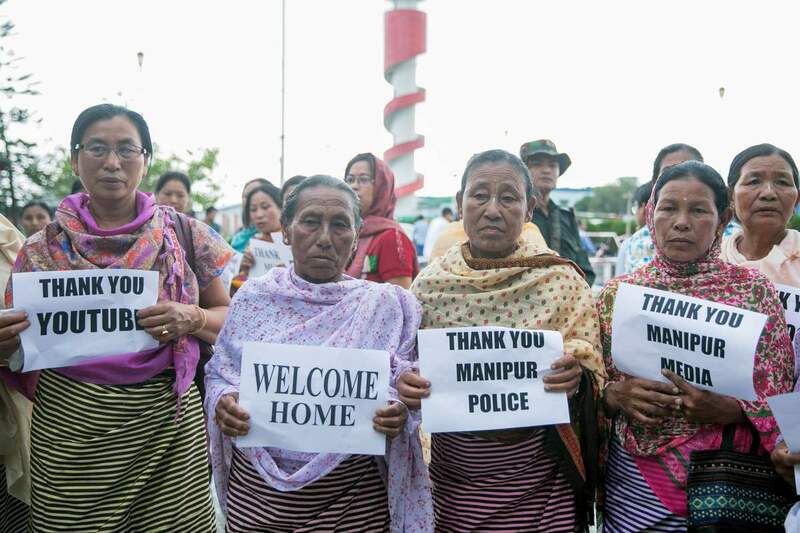 In the video, Singh identified himself as from Manipur. A viewer showed the video to a local association in Imphal who informed Singh's family. Now clean-shaven, Singh said he did odd jobs to survive in Mumbai, which is home to the prolific Bollywood film industry. "I worked in the mills, in shops and big buildings there," he told AFP, refusing to explain why he never tried to contact his family since leaving as a 26-year-old. Singh performed a small prayer before entering his modest thatched-roof house, swarmed by an army of well wishers. "We can't express in words how happy we are because of this reunion," said his younger brother Kulachandra Singh. "In fact, I had a very nice dream a day before and the next day when I woke up this person came to our house to give us the good news (about my brother). "It's really a dream come true for all of us," he said.